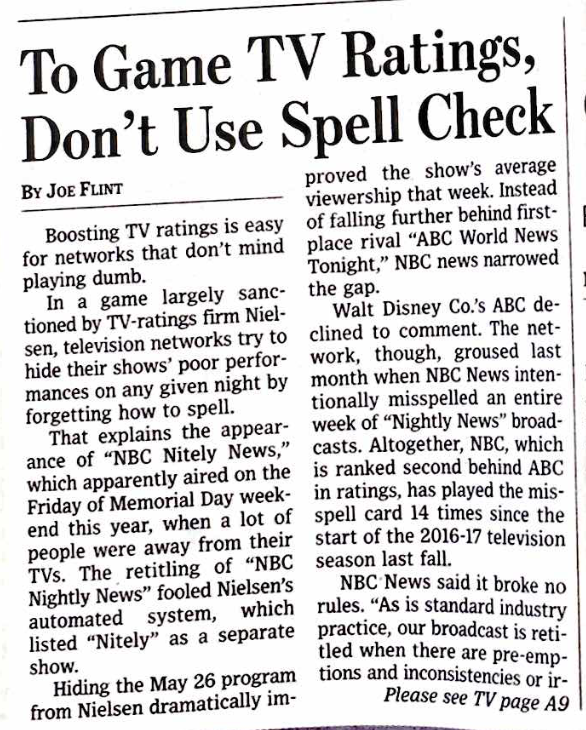 The Wall Street Journal ran an article online with the headline In TV Ratings Game, Networks Try to Dissguys Bad Newz from Nielsen. It got picked up by other outlets, and ran in the print WSJ the next day, on Friday July 7, 2017, on the front page, below the fold. The implication is that networks identify their programs to Nielsen via a free text field with no validation; programs don't have unique IDs. Not having unique IDs is a huge pain even when everyone is trying to be consistent. Inevitably you have to do some kind of deduplication and merging. In this case, it leads to abuse (possibly sanctioned unofficially).